If you check out my life list, you’ll see it’s a work (life) in-progress. #58, See every show/lab in an entire season at the Vineyard Theatre, is ongoing. This is the third post in the series on #58. You can find the first post here and the second one here. 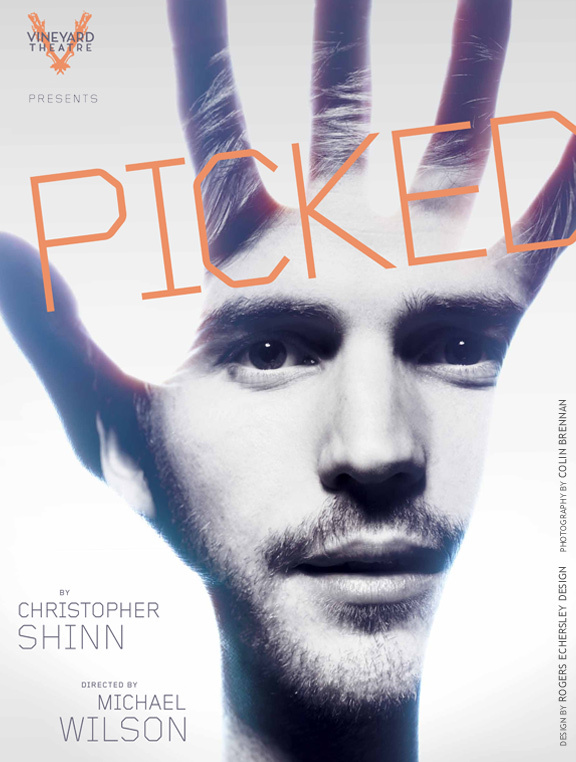 Back in April, I attended a performance of Christopher Shinn‘s play, “Picked” at the Vineyard. It was a solid production of a play filled with fascinating ideas about a film actor, Kevin, who subjects himself to neuroimaging, intense, in-depth interviews and testing in order to deliver an emotionally authentic performance for a legendary director. We learn early on the film script is being developed around the results of the lead actor’s tests. It’s all big ideas and James Cameron-like dreams of moviemaking. To some extent, it’s not far from the truth of how movies, especially the high-tech, high-concept ones, are almost intangible ideas. I had recently come from working on a movie where a majority of our central characters were computer-generated. Human actors would recite dialogue to a red dot placed in their eye line. We would shoot whole scenes where the set would be the only thing to look at, for now. There’s an interesting challenge to work on something that feels like a movie, but it’s only half there. Similarly, in “Picked,” Kevin isn’t entirely certain what all the testing is building up to. He spends a year of his life fulfilling his contractual obligations without ever shooting a frame of film. He has no idea what the script is (if it’s even any good) and he takes a huge gamble in his first leading role. This is not unlike how the moviemaking process really is. 200+ people show up every day to work on something that may/may not be good. Your life is held up for the better part of a year or more while you were insane hours, lose friends and alienate those you love. But, you also make friends, too — your trench mates. The people you see and communicate with the most over the course of a production. “Picked” also offered a subtle glimpse into the major build up behind a film, from shooting (and the inevitable high to low everyone experiences when a production wraps) to anticipation of release, and running the crazy and repetitive publicity gauntlet. The most interesting aspect of “Picked” was the ending. It was real and honest. Shinn captured an eloquence and melancholy that was pitch-perfect in its execution. A lovely, solid (and somewhat insider-y) exploration of the beginning of a career all the way through the end — for those who live a life absorbed in a specific world for so long and then begin to fall out of love with it. This entry was posted in Uncategorized and tagged #58, christopher shinn, film industry, life list, movies, picked, play, the vineyard theatre, theater, theatre. Bookmark the permalink.